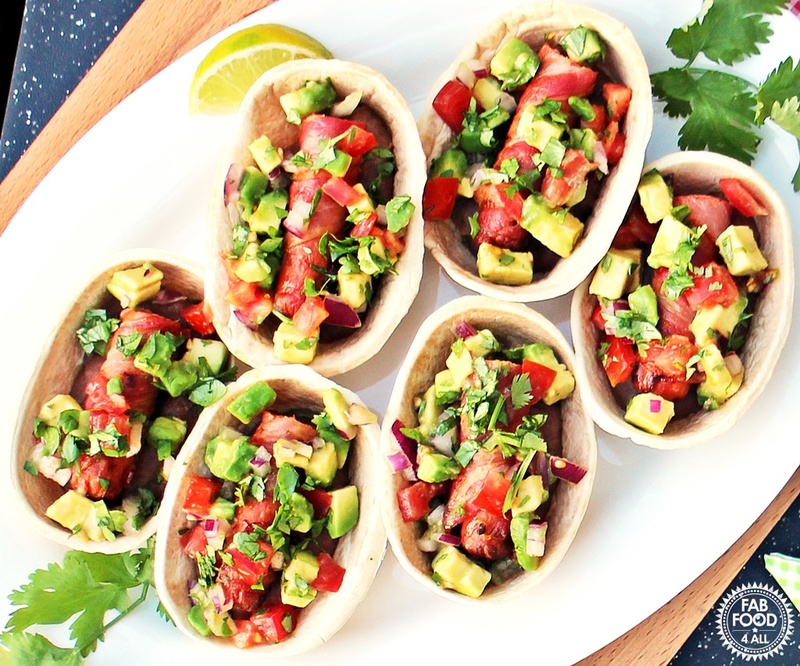 Today I’m bringing you Mexican Hot Dog Tortillas with Refried Beans & Avocado Salsa! 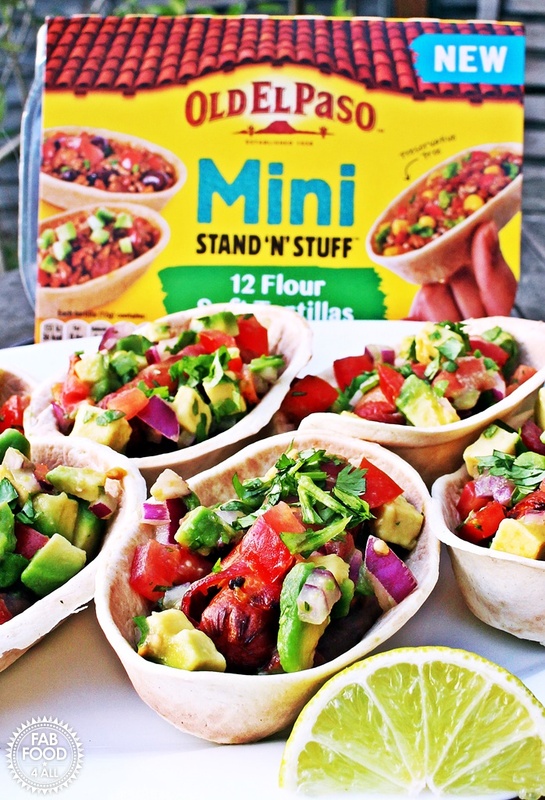 We’re big fans of Mexican food so the launch of the new Old El Paso Mini Stand ‘N’ Stuff Tortillas is great news as we already love the original size! These tasty flat bottomed, soft flour mini tortillas are perfect for a quick meal or snack and are easy to hold for big hands or small! 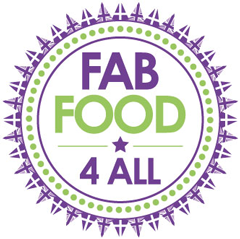 Unlike regular tortillas there’s no folding or rolling, you just load up your fillings and you’re good to go! Eating with you hands always brings an element of fun to a meal and these mini tortillas just put a smile on your face as they showcase the food in such a cute way. So when Old El Paso asked me to develop a recipe I knew I wanted to make something quick, original, child friendly and pleasing to the eye as we eat with eyes first! Hence I took the humble hot dog and gave it a Mexican makeover with the help of some refried beans and an avocado salsa! 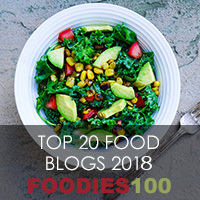 I think even picky eaters can be won over with fun food like this as I know from experience that the same food served in different ways can get different responses. These Mexican Hot Dog Tortillas would make great party food and would also be perfect for Bonfire Night as they’re so easy to hold; think of the Brownie points you’d earn! My family couldn’t wait to tuck into these Mexican Hot Dog Tortillas and polished them off in no time. The variations of fillings that you can use in the Old El Paso Mini Stand ‘N’ Stuff Tortillas are endless and I could even see them being made into a sweet treat but I’ll leave that idea for another day! NB: Recipe commissioned by Old El Paso and all opinions are my own. 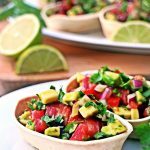 Mexican Hot Dog Tortillas with Refried Beans & Avocado Salsa is great quick and tasty meal that will please the whole family. Preheat grill to moderately hot. Start by stretching out each slice of streaky bacon with the back of knife on a chopping mat. Roll up the frankfurters in the bacon at an angle to completely cover and secure the ends with a cocktail stick. Place frankfurters under the grill turning about 3 times until cooked and bacon crispy, takes about 12 minutes. Once ready you can move them to the bottom of your oven to keep warm. 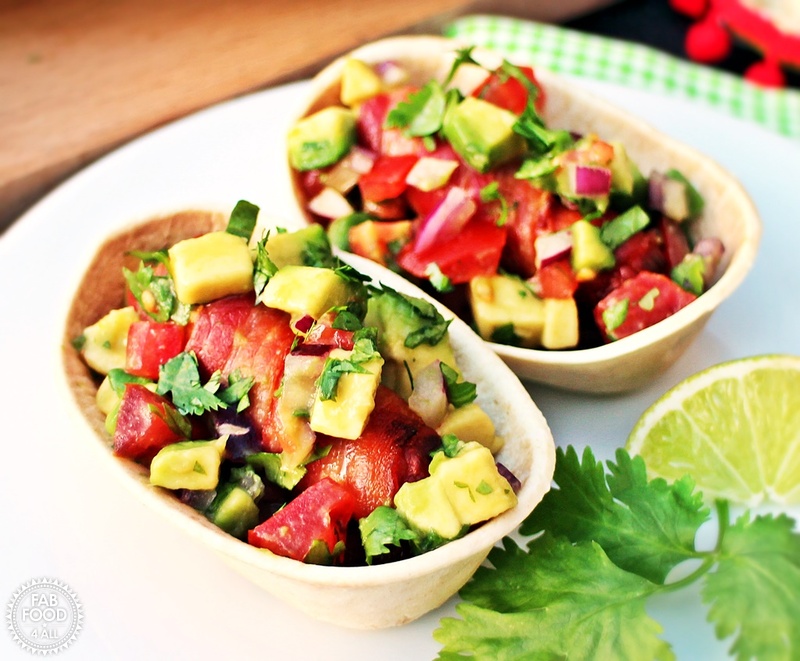 Meanwhile make the avocado salsa by finely dicing up the avocado, tomatoes and red onion and mix in a bowl together with the lime juice and coriander. Cover and place in fridge until needed. Put the refried beans in a pan and heat gently for 4 – 5 minutes. Lay the Old El Paso Stand 'N' Stuff tortillas on plate and heat in microwave for 30 seconds (or refer to instructions for alternative methods). Remove cocktail sticks from the frankfurters and cut in half. Place a couple of heaped teaspoons of refried beans into each tortilla and top with a frankfurter half. 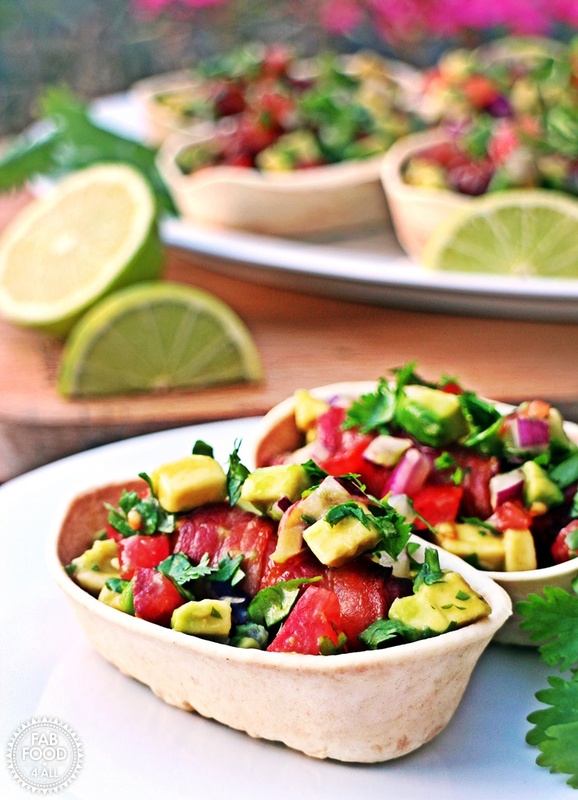 Spoon the avocado salsa over each tortilla and garnish with chopped coriander. Previous Post: « Greengage Jam and what to do when your jam is too runny! Ooh hotdog tortillas what a unique idea! I love tortillas because they are so versatile, you can literally have any filling you want. 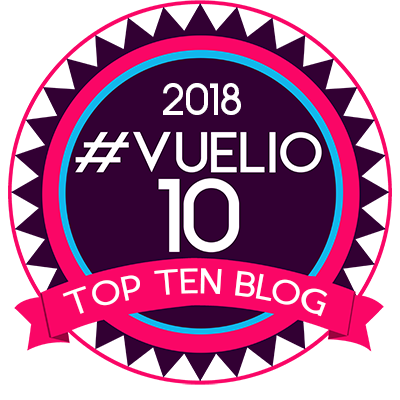 These do look lovely – love refried beans and love tortillas – the two together must be something! !